Hakodate passenger and car ferry ticket prices, timetables, ticket reservations and information for ferries sailing from Hakodate to Aomori and Oma. Compare all available Hakodate ferry ticket prices in real time and book the cheapest available Hakodate car and passenger ferry tickets sailing to and from Hakodate, Aomori and Oma with Tsugaru Kaikyo Ferry ferries online with instant confirmation. Book Hakodate Ferry Tickets with Tsugaru Kaikyo Ferry for ferries sailing from Hakodate to Aomori and Oma online in advance to enjoy the cheapest available ferry ticket price. The price you see is the price you pay. There are no hidden extras or surprises such as added fuel surcharges or booking fees and we do not charge you anything extra for paying with a Visa Electron card. The price we quote you for your selected Hakodate passenger or car ferry ticket, onboard accommodation and vehicle type is all you will pay, and that's a promise. To obtain a Hakodate ferry ticket price and book your ferry ticket securely online please use the real time ferry booking form on the left. You are also able to add a hotel at your destination, or anywhere else, to your ferry ticket when completing your ferry ticket reservation. Hakodate, located at the southern tip of Hokkaido, features a relatively temperate climate and bountiful nature and has continued to develop as a center of administration, economy and culture in southern Hokkaido. Opened as Japan's first port of international trade, Hakodate has experienced contact with various foreign cultures. This influence can still be felt in the city streets and the Western Area to this day. Hakodate's famous morning market is held daily from 5am to noon just a few steps from the main train station's west entrance. More than 360 tightly-packed stalls offer for sale various types of fresh seafood such as crabs (kani), salmon eggs (ikura) and sea urchin (uni), and fresh produce such as melons. Also in the market area are several restaurants which offer fresh seafood breakfasts. A five minute walk from the market will take you to the moored Seikan Strait ferryboat called the Mashu Maru Memorial Ship, which used to link Aomori in Honshu with Hokkaido. There is a restaurant and a coffee shop at the bow where you can spend a nice, relaxing time viewing the scenery around the port. As one of the first Japanese harbor cities to be opened to international trade after the country's era of isolation, Hakodate has experienced notable influence from overseas, and the foreign population's former residential district and a Western style fort are among its main tourist attractions. Mount Hakodate (Hakodateyama) is a 334 meter high, wooded mountain with a nine kilometer circumference at the southern end of the peninsula on which much of central Hakodate is located. Its location allows an unobstructed view of both the city and the Tsugaru Strait. The volcanic activity of the mountain ceased about two million years ago. "Gagyu-zan" is one of the many names of Mt. Hakodate; it means "Lying Cow Mountain" in Japanese, hence its shape. On clear days and especially nights, the view of Hakodate from the mountain is spectacular. If you translate the local tourist brochures, you'll note that they say that the night view (yakei) from here has often been compared to that of Hong Kong or Naples. They say that this wonderful view is due to the fact that the scene is viewed at 8-10 degrees below eyesight. They say that this angle coincides with the view of an airplane pilot engaging in a stable landing, and so the city lights remind the viewer of a runway, giving the viewer a mixture of tension and relief. But what would "they" know anyway. All in all, it is simply beautiful. At the mountaintop, the cable car is connected directly to an all-weather observatory. If you plan to take a walk about outside the facility, it would be wise to bring a light jacket or a windbreaker. The temperature at the mountaintop is no more than 60 degrees Fahrenheit during summer (June - Sept.), but the strong winds will drop the sensory temperature a few degrees. In the winter time, it is brass monkey cold. Fort Goryokaku, meaning 'pentagonal' from its star shape, was constructed in Hakodate from 1857 to 1864 as Japan's first Western style fortress. Its ruins are now the site of Goryokaku Park, which in May becomes one of Hokkaido's most popular spots for cherry blossom viewing with its 1,600 trees. In the hundred foot wide outer moat, where Japanese Carp live, rental boats are popular amongst locals and tourists alike, though from what I could tell it was more of the latter. The Hakodate City Museum Annex is also in the park displaying weapons, uniforms and other historically related articles. The fort and the park can be viewed from the Goryokaku Tower, who stands about 50 meters (over 160 ft.) high by the park entrance. There, you can also learn why pentagonal forts were constructed, and where such forts are located elsewhere in the world. The tower is open from 8:00 am to 8:00 pm and admission is 520 yen. The fort was originally built by the Tokugawa shogunate to guard against attacks from the northern region, along with the Benten-Houdai battery (near Hakodate Dock). The two structures combined took seven years from 1857 to build. A "rangaku" (Dutch studies) scholar by the name of Takeda Ayasaburo designed the fort by researching the European forts and castles. The fort was planned to ready for the modern weapons such as guns. The pentagonal shape of the fort was chosen to minimize the blind spots by placing cannons in each of the corners. In 1868, when the Meiji Restoration led to the overthrow of the Tokugawa Shogunate, loyalist rebels fled to Hokkaido and used Fort Goryokaku as their headquarters in the resulting civil war against the Imperial forces. The rebels intention was to declare the establishment of an independent country to be known as the "Republic of Ezo". For various reasons they were quickly defeated and surrendered in May 1869. From JR Hakodate Station, take a tram to the "Goryokaku Koen Mae" stop (10 minutes). From there, the fortress is another 5-10 minutes on foot. The Kanemori Red Brick Warehouses were originally built in 1909 and remodelled in 1988 as part of a waterfront area redevelopment with a theme of "the old and the new". The area was where shipyards and foreign settlements were once located, but since about 1879 it prospered as a warehouse area. The Kanemori logo on these buildings once symbolized the trade-port of Hakodate. The plaza on the site is where the Hakodate Beer Hall, Kanemori-tei, a seafood and wine restaurant, Kanemori Hall, a multipurpose facility, and more are located. Hakodate's history of beer dates back to 1898 when the Hakodate Beer Hall first opened in Yachigashira. It was very popular until its closing in 1904. Kumashiro Watanabe I, the founder of "Kanemori," devoted himself to the establishment of the Hakodate Beer Brewery, which may have been the first micro-brewery in Hakodate. The Warehouses are approximately a ten minute walk from JR Hakodate Station. Motomachi is a picturesque neighborhood of steep slopes and turn-of-the-19th-century Western-style clapboard homes and buildings. Situated at the foot of Mount Hakodate, the area was a favorite with the many traders from Russia, China, Western countries and other foreign residents who moved to Hakodate with the opening of the port to foreign trade. The area around Motomachi maintains a congenial blend of Japanese and Western cultures in the Old Public Hall of Hakodate Ward, an important cultural property, as well as the old British Consulate, Haristo Sei-kyokai or the Russian Orthodox Church, and the Higashi-Hongan-ji branch temple. One of the neighborhood's characteristic structures is the Motomachi Roman Catholic Church (15-30 Motomachi, Tel: 138-22-6877). After the first Catholic missionary, Rev. Fr. Mermet de Cashon, arrived in Hakodate in November 1859, he built a chapel in 1861. The current structure was built in 1924 after the previous ones burnt down in 1868 and 1921. The altar was contributed by Pope Benedict XV and is the only altar in Japan to have such an honor. Behind the building is a grotto in image of the Lourdes Cave. Motomachi Park is where Hakodate was originally founded. Motoizaka slope, paved in stone, extends wide and straight from the park all the way to the sea. There have been governmental offices located there since the mid-Edo era (1700s). Until 1950, it served as the center of the administration in Hokkaido and Southern Hokkaido area. In the park stands the "Old Hokkaido Agency, Hakodate branch office," built in 1909. In addition to a historical photograph museum on the second floor, the building is also used presently as the local tourist information center. It is open daily 9am to 7pm (to 5pm in winter). The Motomachi district is situated at the foot of Mount Hakodate, and easily accessed from JR Hakodate Station in a 5 minute tram ride or 15 minute walk. The first British consul, a man named Hordison, came to Hakodate in 1859 and established the first consulate from a room he rented from the Shomyoji Temple. After the consulate moved to the present location, it was burned by fire in 1907. The current building was rebuild in 1913. The consulate closed in 1934 but the building was appointed a Municipal Tangible Cultural Property in 1979. The former Consulate has numerous displays of references regarding Hakodate during its port opening and historic exchanges with countries overseas including England. The miniature replica of the "black ships" (Admiral Perry's Expedition Ships) are a popular photographic subject but the Open Port Memorial Hall (1st floor) is the only place where visitors are allowed to take pictures. Its a bit similar in a way to the shiryokan in Shimoda at the bottom of the Izu Peninsula. The furniture and many other items from the time of opening the Hakodate port are also displayed. Light meals or snacks can be enjoyed at the tea restaurant "Victorian Rose," and shopping can be done at the "memorial shop" called "Queen's Memory" where all items are of important from Britain. The first Russian consul general Goskevich came to his post in Hakodate in 1858. The current consulate was built in 1908, and served as a Russian Consulate until 1944 when the last consul was repatriated. A part of the second floor is made in half-timbered style, the red bricks contrasting well with the white mortar. During World War II, the Japanese government got nervous about the building because one could clearly view the ships coming into the port from the ground floor porch. The paranoid Japanese government made a tall fence/wall around the building to block the view of the port. Since 1965 this building served as the "Southern Hokkaido Youth House" of Hakodate City, was used for lodging and training. Unfortunately the interior is no longer open for the public. The consulate is about a ten minute walk from the "Saiwaizaka-slope" bus stop toward Mount Hakodate. A priest named Nikolai first introduced the Russian Orthodoxy to Japan when he visited Hakodate in 1861. This elegant Byzantine-style Church was rebuilt in 1916. The bells at the Nikolai Hall of Kanda, Tokyo were moved from here in 1928. Th church is also affectionately called "Gangan-dera (Ding-dong temple)." Donations required for sight seeing. A fifteen minute walk up the Daisanzaka-slope from the Jujigai Street Car Stop. The Trappistine convent was established by eight nuns from France and built in 1898 to house only nuns. Today, there are about 70 nuns, under the commandment of St. Benedict, supporting themselves in divine devotion by managing dry field and dairy farms. They practice self-sufficiency, rising at 03:30 and sleeping at 19:45. While they are awake, they work for eight hours and also pray for eight hours. They keep their silence except for prayers and hymns. There are branch convents in Nishinomiya Hyogo, Imari Saga, Nasu Tochigi, and Miyako-jima Okinawa. The convent's beautiful brick building with a green roof contrasts with the religious institution it houses. Visitors cannot enter the convent, but there are photographs displayed in the reference room (for visitors) that depict its history and the "life in worship." The convent's store also offers delicious home-made biscuits (also available in stores around town), sweets, and butter, as well as crafts such as dolls. About 2,500 yen ride by taxi from JR Hakodate station. Five minutes from Hakodate Airport. There are bus routes, but it is about 15 minutes walk from any station near by. This hot spring area, located at the mouth of the Matsukawa River, is the oldest known onsen in Hokkaido. The area is dotted with hotels, inns and restaurants situated amidst a peaceful residential area overlooking the Straits of Tsugaru. The area is also a popular swimming spot during the summer. On summer and autumn nights, the lights of the town and of the squid fishing boats reflecting on the water create a peaceful atmosphere. Getting there from JR Hakodate Station takes only 40 minutes by streetcar to the Yunokawa Onsen Station. Best Price Guarantee - We always offer you our lowest available Tsugaru Kaikyo Ferry passenger and car ferries ticket price to and from Hakodate. There are no hidden extras or surprises such as added fuel surcharges or booking fees and we also we do not charge you anything extra for paying with a Visa Electron card. The price we quote for your selected Hakodate ferry ticket, onboard accommodation and vehicle type is all you will pay, and that's a promise! In the unlikely event you find the same all inclusive Hakodate ferry ticket cheaper in the brochure of any other tour operator we promise that we will do our best to beat that price or offer you the choice of requesting a refund. To book Hakodate car and passenger ferry tickets please click here. 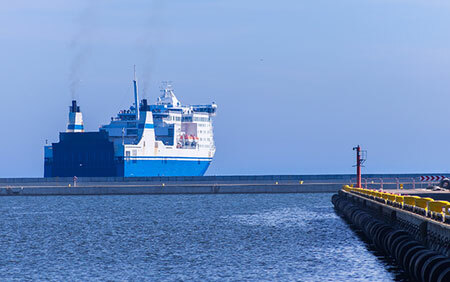 At ferryto.co.uk you are able to obtain live Hakodate ferry ticket prices, check availability and book car and passenger ferry tickets to and from Hakodate at our lowest available ticket price. Ferryto.co.uk is part of the world's largest online ferry ticket distribution network providing the ability to book over 80 major European ferry operators including to Hakodate and to over 1,200 other ferry routes throughout the UK, France, Spain, Ireland, Holland, Eastern Europe, the Mediterranean, the Baltic and North Africa.